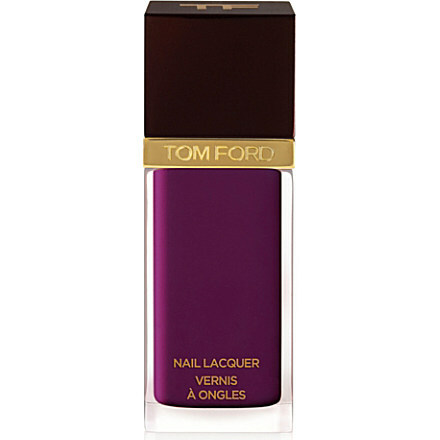 Tom Ford Nail Varnish ‘African Violet’ – On my wish list! So I have decided I want some more posh nail varnishes in my collection. I know some people may think they are a waste of money, but I just absolutely love the packaging of them. I mean, although Barry M does the job, the bottle and feeling you have when using it doesn’t really compare to when you are painting on some Chanel nail lacquer. So, I decided to look on the Selfridges website tonight to see what was available. I instantly fell in love with the first polish I saw (typical). This was the Tom Ford nail varnish in the ‘African Violet’. Now this must be new, as I haven’t seen any Tom Ford nail polishes before (unless I am way behind with my beauty news). The colour is just the most perfect purple shade you have ever seen. it literally makes me come over all funny I love it so much (sad, I know). The only thing I don’t kind of love is the price. At £26 it would be the most I have ever paid for a nail polish in my life and to be honest although I love the shade A LOT, I really don’t know whether it is worth it? Now I don’t have much experience with premium nail varnishes so I need a little help. Do you think they are worth splashing out on over high street brands? Do they do a better job or do you think that people are literally just paying for the label? Let me know any comments you have at all as I really need some advice! Also let me know your thoughts on the new Tom Ford range – is it too expensive and what do you think of the colours in the range (which you can see here). Honestly I would appreciate any feedback you have whatsover. Also let me know if you know any good sites which do premium nail varnishes with free delivery!